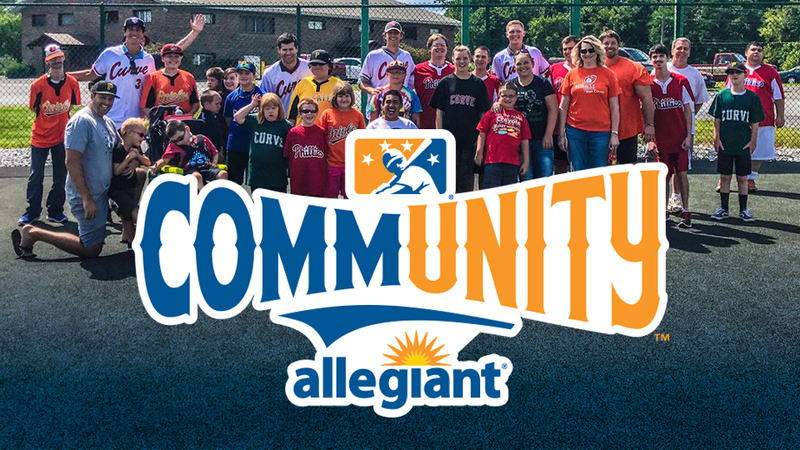 ST. PETERSBURG, Florida -- Minor League Baseball™ (MiLB™) and MiLB Charities, together with Allegiant, today announced that August will be designated 'CommUNITY Month,' presented by Allegiant, across the entire league. For the third consecutive year, the program will promote unity, understanding, acceptance and inclusion in MiLB ballparks and extend into its communities. Minor League Baseball created the MiLB CommUNITY initiative in 2016 in response to a collection of tragedies and tension that developed in communities across the country. Minor League Baseball parks are a place for fans to come together in a safe and enjoyable environment, providing a break from the stresses of today's society. The MiLB CommUNITY initiative aims to go beyond activations in its ballparks and urges fans to take positive action and promote a sense of unity within their communities. "For the past three years, we have chosen August as 'MiLB CommUNITY' Month, but it is important that our teams, fans and partners extend these efforts in their communities throughout the year," said Courtney Nehls, Assistant Director of Community Engagement for Minor League Baseball. "We hope that as fans come into our ballparks to experience a game, they always feel welcome and accepted, and leave wanting to spread those feelings to their friends, family and neighbors for the betterment of the cities and towns where they live." As part of this year's initiative, staff from participating MiLB teams will volunteer with local organizations that make a difference in their respective communities, and players will also be encouraged to make appearances in their communities and participate in local volunteer events. The Lexington Legends, winner of the 2017 John Henry Moss Community Service Award, engage their community and the entire Central Kentucky region through community service, their charitable foundation and outreach programs. The award recognizes a club that demonstrates an outstanding, on-going commitment to charitable service, support and leadership within their local community and within the baseball industry. "The Legends are thrilled to be a part of the CommUNITY initiative again this season," said Andy Shea, team President & CEO. "Community involvement is an integral part of the Legends' core values, and teaming up with Minor League Baseball through this important program enables us to impact even more members of the Bluegrass." In addition to volunteer efforts in MiLB communities, at home games in August, teams will feature public address announcements, in-game promotions and photo opportunities for fans to show what CommUNITY means to them. Allegiant will also provide all participating teams with flight vouchers to use in support of the initiative's mission. Fans can take part in the MiLB CommUNITY Month initiative on social media by using #MiLBCommUNITY. Minor League Baseball announced an institutional partnership with Allegiant on July 26, making it the "The Official Airline of Minor League Baseball."